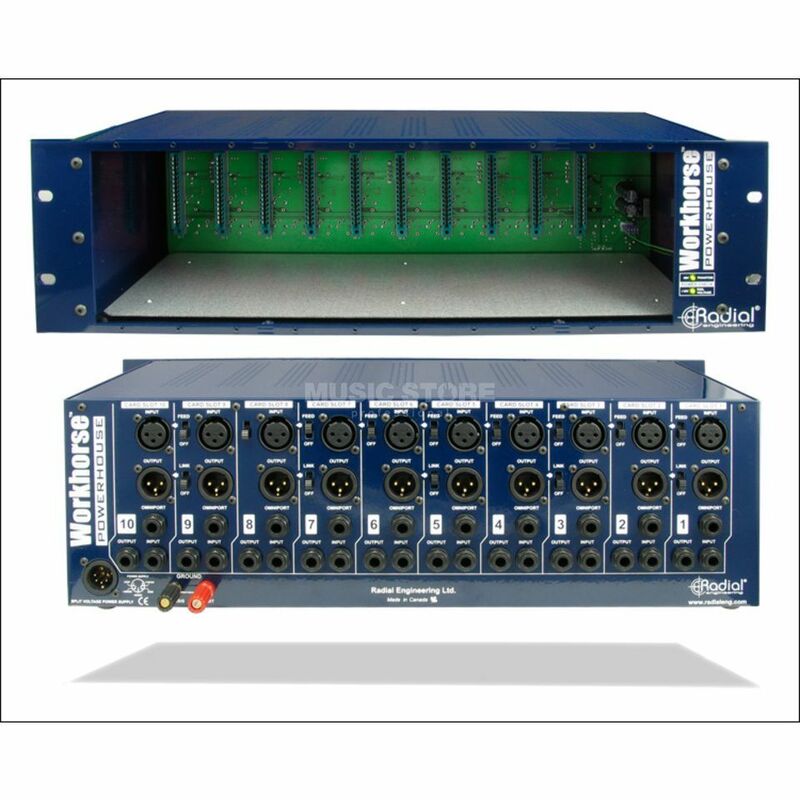 The Radial Workhorse Powerhouse is a 10 module 500 series power-rack designed to accommodate both older and newer 500 series modules and provide the studio with maximum density in a standard 19" rack frame. The design begins with heavy 14 gauge steel construction and durable powder coat finish for maximum shielding against noise and greater durability when subjected to road use. An 'easy glide' slider tray makes it painless to align the PCB connector to the 15 pin card edge receptacle when swapping modules. Once connected, the rear panel sports a standard array of XLRs to connect to and from the workstation or mixer. This is augmented with a series of ¼" TRS connectors that enable cross-patching and open the door to the excitement of parallel signal processing. Instead of having to hard patch modules together using a cable, the Powerhouse incorporates an innovative feed switch that instantly connects the signal to the adjacent module. This makes building signal chains quick and eliminates the need for extra cables. And unlike older racks that require soldering when modules are used in stereo, the Powerhouse is equipped with a stereo link function that takes care of the task with a simple slide of a switch.